Manifesting Wisdom, Compassion, and Power. Just a half hour from Northampton, MA and the Five Colleges, accessible by plane to Hartford, CT's Bradley airport (1 hr 15 min), by Amtrak (new station now open in Northampton), bus and car, with shuttle services or possible ride sharing opportunities available. Registration Now Open! Register Here. Pay for the workshop here. SPECIAL OFFERS: Anyone who registers for any part of the retreat will receive a coupon code good for 30% off any item in my Etsy shop (including the Tara Wisdom Cards). "Among the many derivations offered for the mysterious word Tarot ..... the Oriental background of card-divination and the 21 numbered cards of the Major Arcana suggest an older connection with the Goddess Tara, the Aryan Great Mother as "earth," whose name gave rise to Latin Terra Mater and Celtic Tara. From ancient times, this goddess was assigned 21 forms. Magic diagrams, or painted dice-boards for divining the cause of illness, prophesying, and so on, are still known as the "21 Taras." Dive deep into these wisdom traditions by entering the gate of Tara’s Wisdom Cards. Explore the connection between the Goddess Tara of the Tibetan tradition and the Major Arcana of the Tarot with your dancing body. 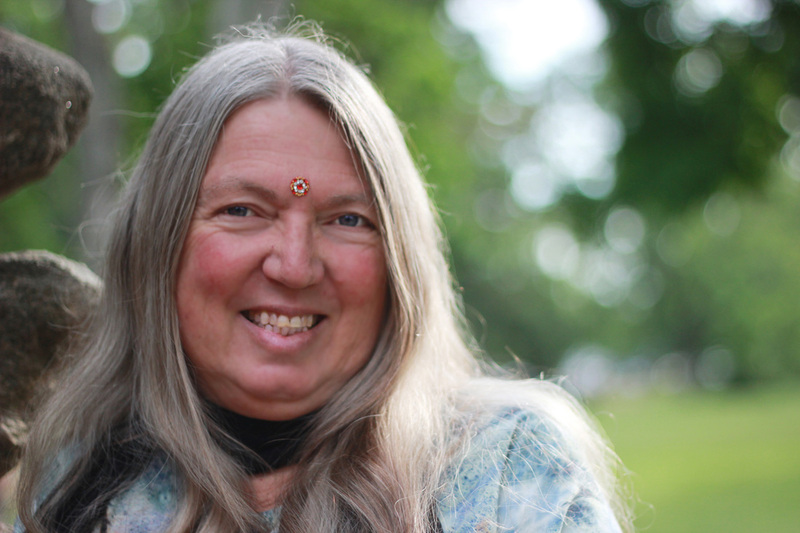 The weekend retreat will be led by Prema Dasara and Zebrine Gray. Prema is the Spiritual and Creative director of Tara Dhatu – an organization dedicated to uplifting humanity through the sacred arts. Zebrine is a priestess of the western mysteries, the creatrix of Tara’s Wisdom Cards. In this workshop, she will offer practical opportunities to use the Tara Wisdom Cards for divination and meditation and rituals. The weekend will include dances of Tara and other Tantric Buddhist deities. These are profound ritual experiences leading to amazing states of body - mind. They will be joined with a series of Tarot songs and dances set to Brazilian rhythms created in Rio de Janiero by a group of dedicated Tarot students. Reflecting the wisdom of the Kabbalah and other profound mystery schools, these dances are joyful and deep. In addition to the Major Arcana, Zebrine will offer insight into the court cards and minor arcana, which are also based on dharma teachings. No dance experience necessary. Come with an open heart, an open mind and your dancing shoes on. Friday Night: The Fool's Journey. Listen to the call as we begin our “Fool’s Journey” of joyful exploration. We embody the ancient images of Tarot and the Tibetan Buddha Goddess, nurturing our wisdom, compassion, and power. This evening workshop (open to the public) will include dances of "The Fool" and the 21 Qualities of Tara, an introduction to wisdom practices, and an exploration of how to interpret tarot cards. Whether you are a beginner or an advanced practitioner, this workshop will give you insight to deepen your practice. Saturday Morning: Manifesting Abundance of Gold Tara. Through the element of Earth, the wisdom of the Gold Tara, the Ratna Dakini, and the minor arcana "Wheels" cards, we will begin our morning with auspicious practices, including the dance of the "Empress" from the tarot. Saturday Afternoon: Manifesting Wisdom of Green Tara. Through the element of Air, the activity of Green Tara, the Karma Dakini, and the minor arcana "Bells" cards, we will hear Tara's wisdom, including "Calling Tara from the Heart." Saturday Evening: Manifesting Compassion of Blue Tara. Through the element of Water, the discipline of Blue/Black Tara, the Vajra Dakini, and the minor arcana "Vases" cards, we will dive into Tara's compassionate waters as well as the deep "wrathful" practices, including the dance of "Death" from the tarot. Sunday Morning: Manifesting Power of Red Tara. Through the element of Fire, the magnetism of Red Tara, the Padma Dakini, and the minor arcana "Vajras" cards, we will spark Tara's flames of power, including "The Wheel of Fortune" from the tarot. Sunday Afternoon: Manifesting Spaciousness of White Tara. Through the element of Space, the pacification of White Tara, the Buddha Dakini, and the Court cards of Antidotes to Fears and Auspicious Offering Dakinis, we will close with expansive spaciousness, including the "White Tara and the Six Shields" practice to bring all of the elements together. Located in a beautiful natural setting in Northwestern, Massachusetts, Nine Mountain Retreat center offers warm, comfortable communal living for our residential retreat. This is a unique opportunity (with hot tub!) to study with two teachers and learn more about these magical cards. By practicing together in an intimate and beautiful New England nature-filled setting (with hot tub), where we will have our own gourmet cook, we will have the opportunity to go deep. Organic vegetarian meals are included (with accommodation for dietary needs). Lodging will be mostly in dorm-style rooms. Our retreat and dance sessions will take place in the spacious living room. Register Here. Space is Limited, so register right away! Detailed directions, including costs of ground transportation from airports, are available on the website of their sister retreat site, Earthdance, which is within walking distance of Nine Mountain. All fees are offered on a sliding scale, with the basic price in the middle. If you are able to offer more, please do. We wish to make this accessible to all who need it. Deposit of half the fee is due at the time of registration to hold your space. (Deposit refundable up to March 1). Residential spaces are limited. Register soon! Prema Dasara, creatrix of the Mandala Dance of the 21 Praises of Tara, has been developing the relationship between the Taras and the cards for some years. She works primarily within the Tibetan Buddhist tradition, though her background is eclectic, having immersed herself in the study of comparative religion and western psychology for many years. She has studied with masters of the sacred dance of India, Nepal, Tibet, and Bali. Her work is timely and timeless and is considered to be a bridge between eastern and western expressions of ancient wisdom by His Holiness the Dalai Lama and many other great teachers. Zebrine is a Dharma Pagan priestess, having trained and practiced in modern pagan traditions for nineteen years. She is also a third-level teacher of the Tara Mandala Dance. 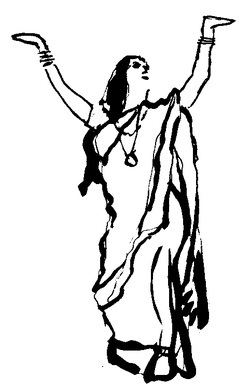 She blends Tara practice into her Goddess rituals of the seasons and the moons. Zebrine created the design and artwork of the Tara Wisdom Cards over the course of eleven years. She offers readings, classes, and original Tara artwork. Brazil is a land with many musical and dance influences and one of the magical things about this effort is that each of the dances is developed around a cultural rhythm. Arcana #3 is a Samba, #15 is a Tango, #16 is based in the rhythms of Capoira, #13 is a Amazonian Native ritual. Coupled with the development of consciousness that an in depth understanding of the Tarot provides, the experience of these dances is multileveled. They are fun to dance. They are profound. There is a CD of the dance music that is in both Portuguese and in English. This, and a song book will be available for purchase at the event. ​Zebrine designed and created the artwork for the Tara Wisdom Cards, a unique 78-card deck based on the manifestation of the many faces and forms of Tara, the Tibetan Goddess of Wisdom, Compassion and Power. Following the structure of a traditional Tarot, the deck includes 22 major arcana, 16 court cards and 4 suits of elemental minor arcana. They incorporate traditional Tibetan iconography with photographic images of the beauty in the natural world. 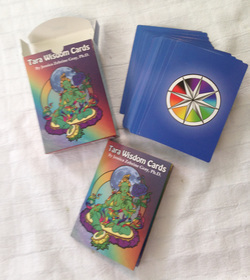 Participants are encouraged to bring their own copies of the Tara Wisdom Cards deck, though some will be available for use by those who do not have their own decks.